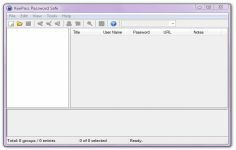 KeePass is a useful password manager software that allows management of passwords in a secure way. Based on a dual AES encryption , Rijndael and Twofish algorithm - two of the most powerful at the moment, also used by banks- this software gathers all of the serial numbers, logins, passwords and other account numbers in a single interface. It is only necessary to remember one password or insert a removable drive to have access to the password database. It is also possible to generate a key to copy to removable media to prevent the reading of the database if the password is stolen. The information contained in the database data can be classified into different categories for easy access to the password needed. The interface has a tree form that is customized to each recreation and password, that can be associated to a web page, a comment, an expiration date. The software requires no installation, as it can run directly from a USB stick or hard drive so no information is stored on the system to avoid any form of piracy. KeePass is a very useful solution for you when you deal with many accounts that require password. You have a smart way to keep all your passwords at your fingers - pay importance to use different passwords for different accounts for better security - just by keeping in mind one single master password that offers access to the rest of your passwords. - it offers random password generator. - to offer users the possibility to use on different computers using cloud technology.